On average, all of those gains come on the two days surrounding Thanksgiving, which are 51-8, up 86.44% for an average gain of 0.80%. The Turkey trimmings really take their toll on the Monday after Thanksgiving, as it takes the big hit, 24-35, up only 40.68% of the time for an average one day loss of 0.38%. The last five Monday’s after Thanksgiving have been down, including last year’s (2008) loss of 8.93%. 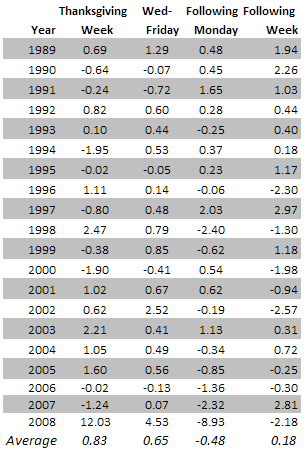 I couldn’t distinguish a discernible difference in the data in up or down years. It has been my observation that since these type trading strategies became well documented over the last couple of decades, they tend to be anticipated a day or two. Be careful. The first column is the Thanksgiving week (not weekend), good luck.